A free adventure module for fifth edition Dungeons and Dragons. This adventure takes place after a Total Party Kill (TPK). It allows a group of DEAD PCs to earn a second chance by fighting their way through the first layer of Hell to retrieve a stolen artifact. It is unlike other modules in that it is written to accommodate a party of any size and any level (1 to 20). This is a complete re-write of the module I posted previously. I updated the entire module to work with D&D 5E rules. 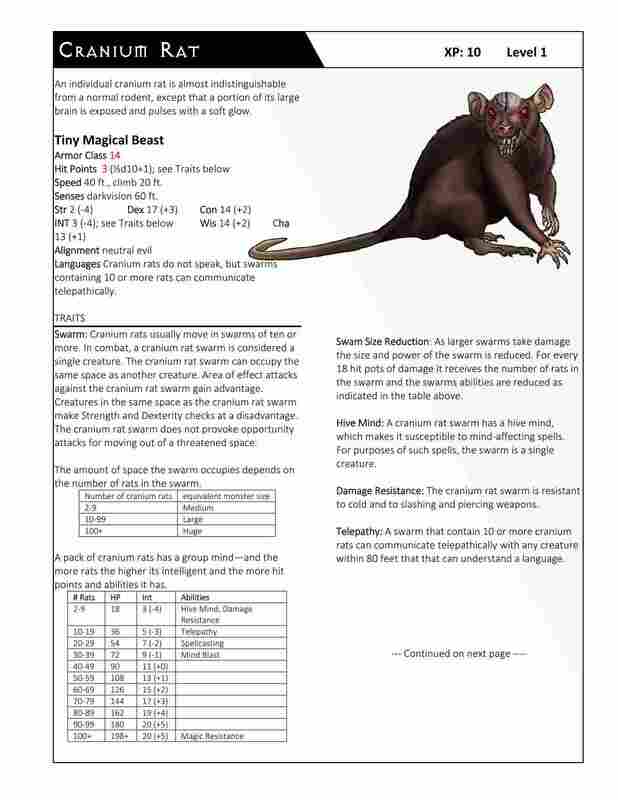 It also includes converted monsters that are not in the 5E Monster Manual – on new color reference sheets – Abishai Devils, Kaorti Devils, Nupperibo Devils, Cranium Rat Swarms, and Winged Fiend Swarms (a new monster of my own creation), and Charon (Boatman of the Lower Planes). I hope you enjoy this as much as I enjoyed writing it. Please post any comments you may have. Let me know if you find any of this useful. I converted this monster to D&D Next. I may have to re-do it once the official new rules are published. It is unusual in that it is not your typical swarm. It can contain any number of rats and the more rats the more powerful the swarm. Let me know how you think I did on this. Comments are always welcome. An individual cranium rat is almost indistinguishable from a normal rodent, except that a portion of its large brain is exposed and pulses with a soft glow. Singly, the creatures are also virtually identical to normal rats, but they are never encountered singly. Cranium Rat Swarm – scalable to any level! The Fiend Folio has 3 listings for Cranium Rat Swarm (Lesser Pack, Average Pack and Greater Pack). I combined them to make the stat block below. In the stat block below np = number of packs in the swarm. A pack contains 30 rats. The number of packs in the swarm determines the Challenge Rating (divide the total number of rats by 30). If “np” is preceded by a number, multiply the number of packs in the swarm by that number. For example where it says Listen = +3 np; If there are 6 packs (180 rats) in the swarm then Listen will =+18 (3×6). DETECTION – Senses Darkvision 60-ft; Listen +3 Packs, Spot +3 Packs; Init +7; Languages Cranium rats do not speak, but swarms containing 5 or more packs can communicate telepathically. Spells: If the swarm’s np (number of packs) is 4 or less its intelligence is too low to cast spells. Larger swarms can cast arcane spells as a sorcerer of a level equal to the swarm’s np up to a maximum 10th-level sorcerer (spells/day and spells known are the same as for a sorcerer of the appropriate level; save DC is 10+ the sorcerer level + spell level). A typical 10th-level spells known list: 0—dancing lights, daze, detect magic, flare, ghost sound, mage hand, open/close, prestidigitation, grease; 1st— charm person, expeditious retreat, magic missile, ray of enfeeblement, shocking grasp; 2nd—blur, knock, mirror image, see invisibility; 3rd—fireball, lightning bolt, slow; 4th—contagion, fire shield; 5th—hold monster. Distraction (Ex): Any living creature that begins its turn with a swarm in its space must succeed on a Fortitude save or be nauseated for 1 round. The save DC is Constitution-based. DC 15 for np of 4 or less, DC 18 for np 5 to 9, DC 24 for np 10 or more. Mind Blast (Su): This attack is a 60-foot cone. Anyone caught in this cone must succeed on a Will save (DC 14 for np of 4 or less, DC 17 for np 5 to 9, DC 23 for np 10 or more) or be stunned for 3d4 rounds. A cranium rat swarm with 4 or less packs can use this power every 2 rounds. Larger swarms can use it at will. Hive Mind (Ex): A cranium rat swarm has a hive mind, which makes it susceptible to mind-affecting spells. For purposes of such spells, the swarm is a single creature of the magical beast type. Telepathy (Su): An swarm of cranium rats that contain 5 or more packs can communicate telepathically with any creature within 80 feet that has a language. 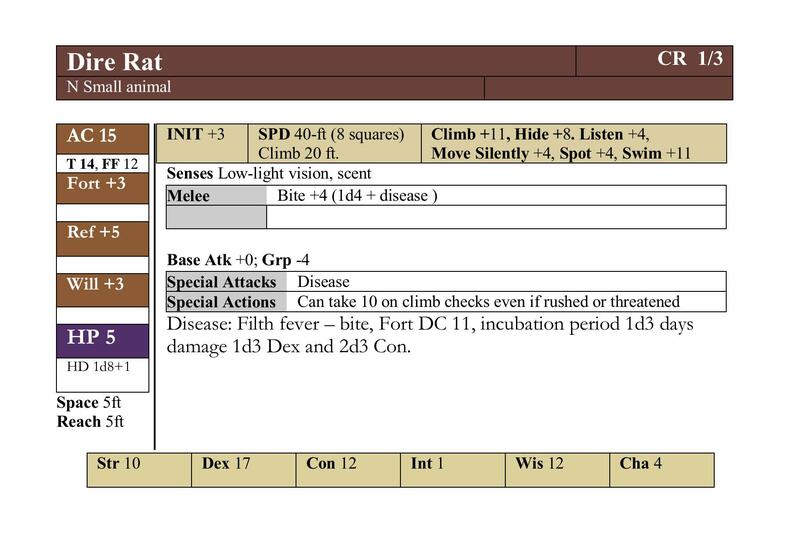 Skills: Cranium rat swarms have a +8 racial bonus on Climb checks and can always choose to take10 on Climb checks, even if rushed or threatened. 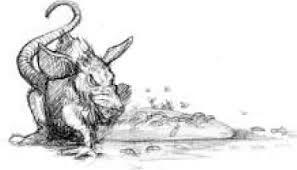 Combat: While dangerous and unpleasant, cranium rats are not aggressive creatures. They avoid open attacks in favor of flight or ambushes. Cranium rats use their spells and mind blast ability to soften or incapacitate victims before swarming over them, then they drain their victims’ blood through a hundred tiny wounds. Like ten thousand eyes and ears dispatched to gather secrets for some dark deity of knowledge, cranium rats are everywhere—seeing, hearing, and sharing what they learn in a bizarre hive mind. An individual cranium rat is almost indistinguishable from a normal rodent, except that a portion of its large brain is exposed and pulses with a soft glow. Singly, the creatures are also virtually identical to normal rats, but they are never encountered singly. A pack of cranium rats has a group mind—and the more rats, the more intelligent the group mind.